This is something we often refer to in terms of missing a fun event or party with friends. We hate the feeling that we were not there for something important, something epic, something fun, where memories were made and friendships created. Despite rampant hunger and malnutrition around the globe, many Americans, on the other hand, are bombarded with vast amounts of food variety that showers us daily in supermarket aisles, restaurants and buffets. Because we are a species that values and seeks out variety, we feel compelled to partake in it all, lest we miss out on anything. 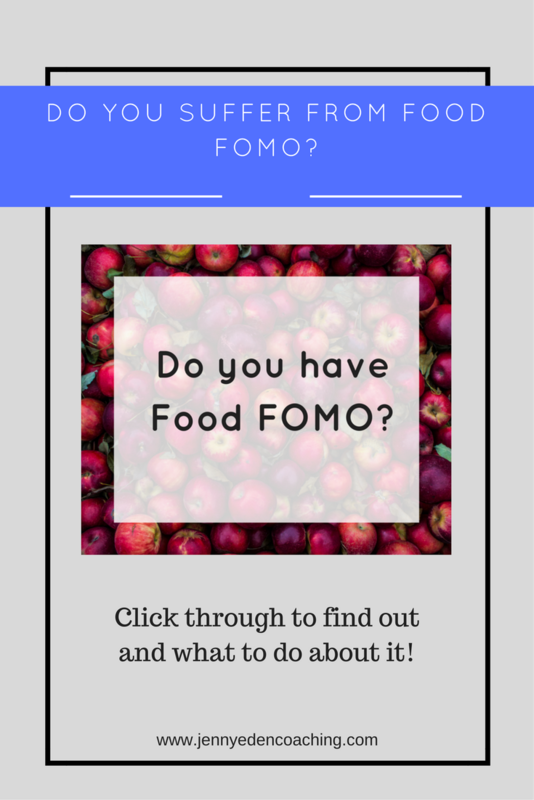 Food FOMO also leads us to overeating past the point of what our bodies need or want, causing angst, physical ailments and overall malaise. I’ve worked with clients who came from large families with 6 or more siblings and if you weren’t fast and furious with your eating and grabbed what you could, you’d miss out on dinner. Food FOMO can also be lasting vestiges due to cultural factors that shaped our relationship with food: The Holocaust survivor’s children as well as those who experienced the Great Depression were taught to finish their plates and appreciate all food which was scarce, in order to prepare for a potential famine. While we now enjoy a relatively stable economy, there are many thousands who go to bed hungry, even here in America. 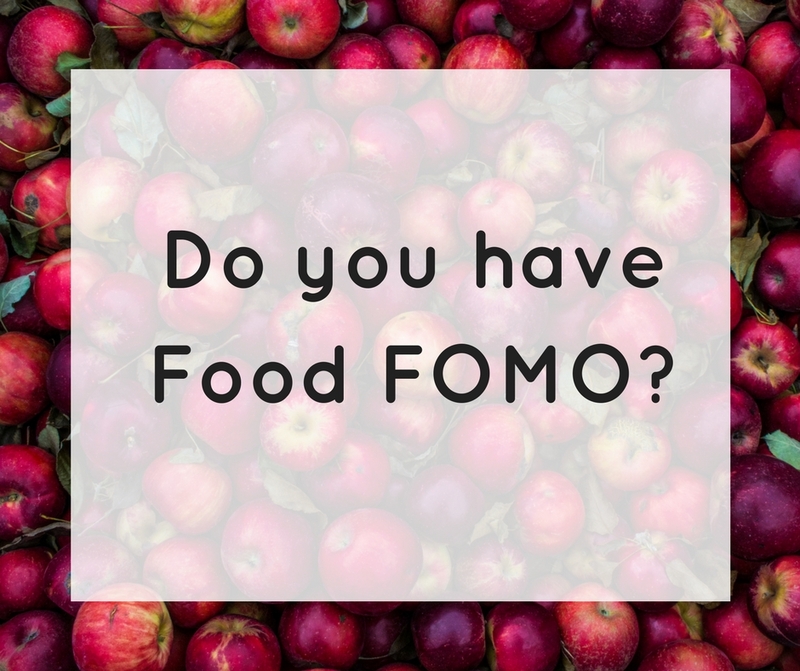 But this doesn’t diminish the fact that for many, food FOMO is a real anxiety that is also often the precursor for eating rapidly, overeating, binge eating and developing a disordered relationship with food. If you have spent a good part of your life yo-yo dieting, you know that there is often self-prescribed scarcity just around the corner. You had better take part in all the variety of ice cream at the sundae bar because come Monday you’re off to the races with the restriction of your next diet. And, if there is a real or perceived belief that there is or will be scarcity of food, this only serves to create more anxiety when faced with an abundance of choices. This is why we can feel elated yet overwhelmed at the 15,000 choices of chips in the chips aisle at the supermarket, and why our eyes are often bigger than our bellies at an all-you-can-eat buffet. One way to deal with food FOMO is to build in mindfulness and mindful eating practices. When you can slow down, invite gratitude for your food, appreciate where it came from and intellectually process the fact that this food fortunately will always be available to you, you can begin to have a more relaxed approach towards food. Free samples offered at banks, Starbucks etc. Meals that have a lot of “fixings” like a potato bar, ice cream sundae bar, or BBQ. Is your body physically hungry right now? What is driving your decision to eat right now? Is this food readily available to me or is this a special or seasonal food that only comes around once in awhile? Question your food FOMO and recite mantras that keep you in “abundance” mindset instead of “scarcity” mindset. Mantras might include: “I place no restrictions on myself around food therefore this food will always be available to me”, or “I will listen to my body and trust that I will know when I’ve had enough to eat”. Feel free to pick your own incantation that makes sense for you but be sure to have an empowering, reassuring slant to it to assuage you of your food FOMO. When have you experienced food FOMO? How have you dealt with it? Sound off below!